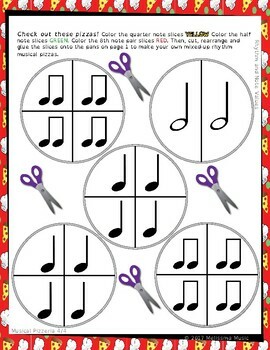 Practice quarter notes, 8th notes and half notes with these 4/4 musical pizza slices. 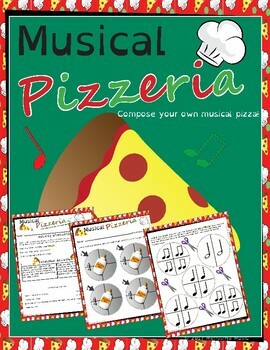 Students will identify notes by color and then create their own rhythms by slicing and re-arranging their pizzas. 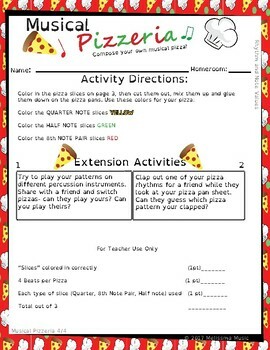 Includes a direction sheet, extension activities and rubric. Featuring all-new graphics and easy to follow directions supported by picture cues, students will love this outside-of-the-box activity! Thank you for checking out Melissma Music. Your purchase goes towards my goal of purchasing a home for our growing family. If you notice a problem, please let me know and I will fix it for you A.S.A.P.! 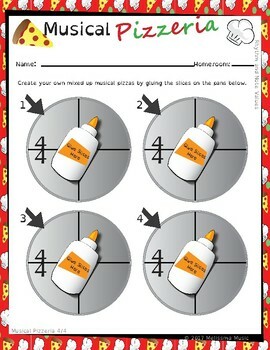 Please visit www.MelissmaMusic.com for more cool music education activities or to purchase our newest book, Barnyard Beats! Using one of our products? Snap a picture of it in action and I'l send you a coupon for 50% off any one item in the store! E-mail your picture to Melissma22@hotmail.com and it might end up on our facebook, website or twitter pages!